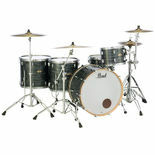 The Pearl Session Studio Classic drum sets follow the original Session “recipe” with blended Birch and Kapur shells, recreating the classic “Session sound” of strong attack and projection with outstanding lows and punch that you can feel. The reinvented SSC are finished in the same gorgeous high-gloss “31 step” lacquer finishes that are featured on Masters, Reference and Masterworks. Choose from three dazzling stocking finishes including Piano Black, Sequoia Red, and Sheer Blue. The available Pearl Session Studio Classic snare drums feature SuperHoop II hoops for outstanding rimshots and cross-stick effects while still providing excellent “openness” and resonance. Three shell packs and individual components are available in shorter depths, in order to achieve a “shorter” note and quicker response. 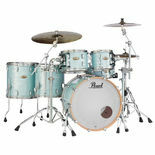 Whether you're new to the game, or you've been around the block, Pearl Session Studio Classic is your kit.